Your trip begins today in Quito, Ecuador. 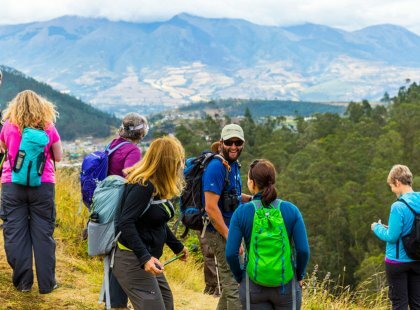 Arrive in Quito at any time today, pass through customs, gather your luggage and transfer on your own (or book a private transfer with REI Adventures) to our hotel for the evening. Dinner on your own if flight time allows. Day 2: Shop the indigenous market in Otavalo and hike to Peguche Falls. Following breakfast and ready to depart, meet your guide and other group members in the hotel lobby. We head immediately north of Quito to the highlands. Along the way, we'll cross over the equator providing a fun opportunity to be in both hemispheres at the same time. For centuries, regional markets have played an important role in Indian life, providing regular gathering places for trade and socialization. 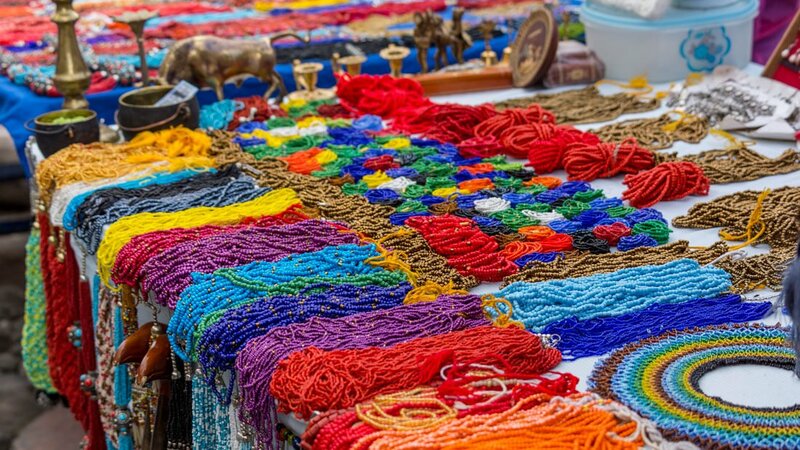 Today we explore one of the most famous Ecuadorian Indian markets in Otavalo. 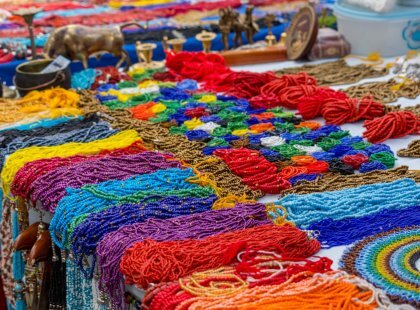 This colorful market dates back to pre-Inca times and is well known for its fine textiles, tapestries and Indian jewelry. 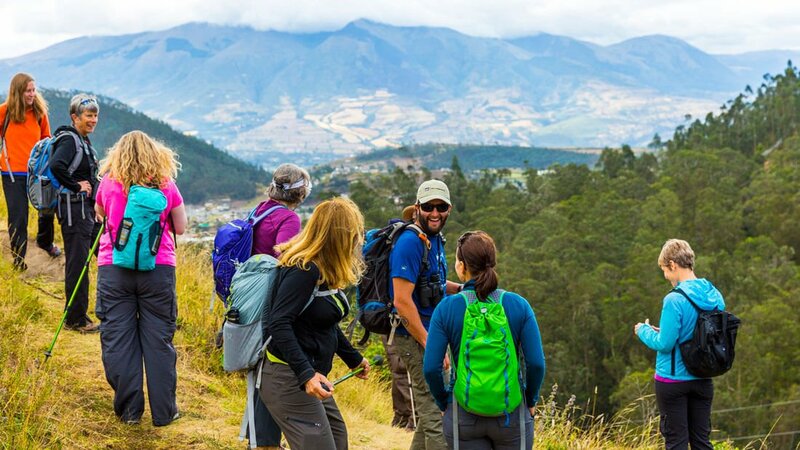 While in the Otavalo region we will also visit one or two of the local communities such as the Peguche, Carabuela or Quichuqui, known for their tradition of ancestral healing practices and fine craftsmanship. If time allows, we may stop for a quick hike at Peguche Falls, a pretty waterfall nestled in the green rolling hills just outside of Otavalo. This evening we retire to the lovely estate of an historic hacienda. Originally built in the 1700s and 1800s, haciendas today have modernized amenities but maintain their warm character and authenticity. Take a step back in time as you wander the lush grounds of this colonial style estate. All meals included. Optional hiking: 2-3 miles, 1 hour, between 8,300' – 9,300'. 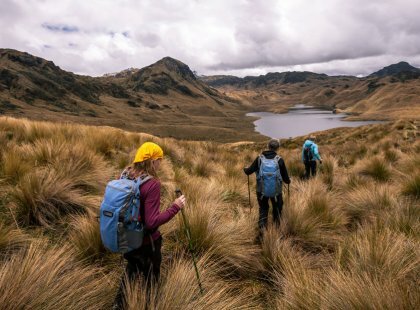 Day 3: Hike around Laguna Cuicocha in the crater lake region. This morning we continue to explore the highlands and emerald Laguna Cuicocha (10,638'), a crater lake surrounded by the rim of Cotacachi volcano. Winding up to the lake, we drive through incredible Andean cloud forest scenery, glimpsing views of nearby snowcapped mountains. We dedicate the day to hiking and exploring this fascinating crater lake region. The flowers are superb and so is the birding. You may see such Andean birds as caracaras, buzzard eagles, hummingbirds, ducks, hawks and the occasional condor. On a clear day the views of the surrounding countryside are breathtaking. It is the perfect spot to enjoy a fantastic picnic lunch. In the afternoon, we'll visit the town of Cotacachi, an artisan city known for its leather goods and handicrafts. We have time to walk around before returning to our comfortable hacienda for the evening. All meals included. Hiking: 4-5 hours between 10,000' – 11,300'. Day 4: Walk in a nature reserve or soak in thermal pools. 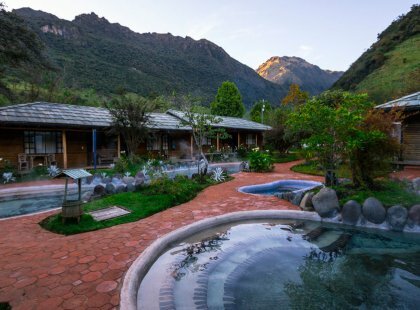 Today we leave our hacienda and travel south along the inter-Andean valley to the Cayambe Coca Natural Reserve. 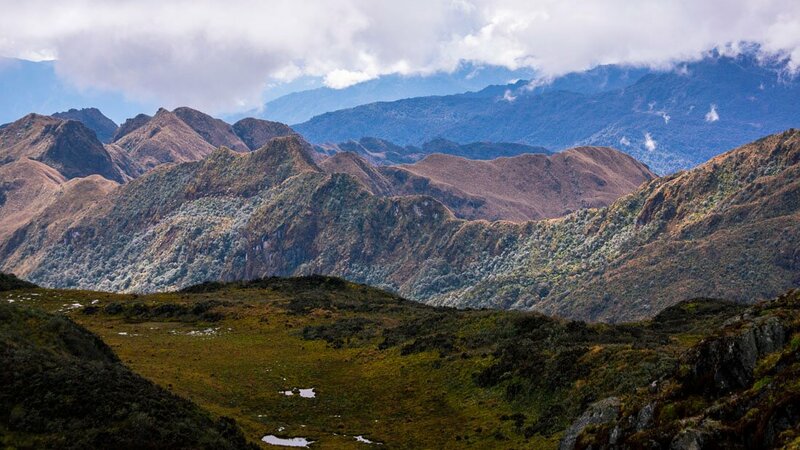 We follow the same route as the Spanish conquistador, Francisco de Orellana, in 1542 as he crossed the Andes mountain range upon discovering the Amazon and Amazon River. 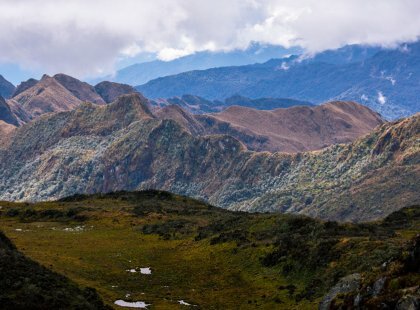 The Cayambe Coca Natural Reserve contains the most plant and animal diversity in all of Ecuador. As we explore on foot, we'll learn more about the area's rich biodiversity and experience two distinct environments - lowland rainforest and mountain rainforest. Lakes, rivers and hot springs spread across the region creating very unique ecosystems. 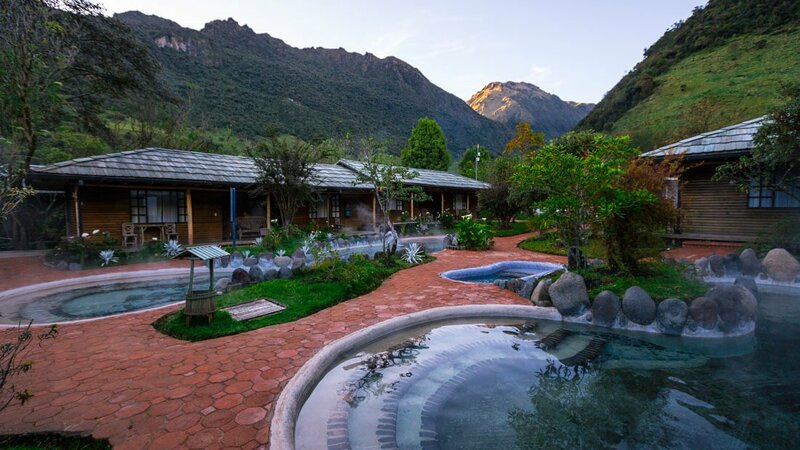 Tonight we can soak in one of many natural thermal springs and pools at our lodging, Termas de Papallacta, nestled in the cloud forest. All meals included. Day 5: Trek to Frigate Hill on San Cristobal Island for fantastic vistas. It's off to the Galapagos Islands this morning! A transfer is provided to the airport where we board our flight to the islands, located roughly 600 miles offshore. After our plane makes a brief stop in Guayaquil, we land on San Cristobal Island where we spend the next two days hiking, kayaking, and snorkeling. Upon arrival in the Galapagos you are obligated to pay a park entrance fee of $100 per person (subject to change) - you should have this handy in U.S. dollars. After lunch overlooking the ocean, we head out for an afternoon of exploration. Our first stop is the impressive San Cristobal Interpretation Center where we learn about the volcanic formation of the Galapagos archipelago and the unique evolution of life on the islands. Our walk this afternoon is along trails of lava rock into dry forest of cacti, acacia, palo santo, Galapagos cotton, and other endemic vegetation and features splendid views of the rugged coastline. As we approach Frigate Hill, be on the lookout for blue footed boobies, the magnificent frigate bird, Darwin finches and much more. On our way back to our lodging, we may stop for a refreshing dip at Carola or Mann Beaches. In the evening we explore the small town of Port Baquerizo Moreno before dining at our waterfront hotel. All meals included. Hiking: 3 miles, about 2 hours. Today is all about being on the water! We slip into our ocean kayaks and spend the morning paddling along the coast, past Carola Beach and into Darwin Bay, the site of the first landing of the HMS Beagle. 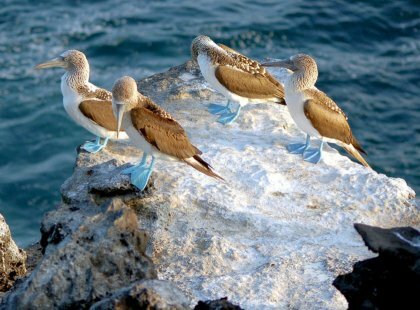 The route is home to colonies of sea lions, marine turtles, blue-footed boobies, and frigate birds. 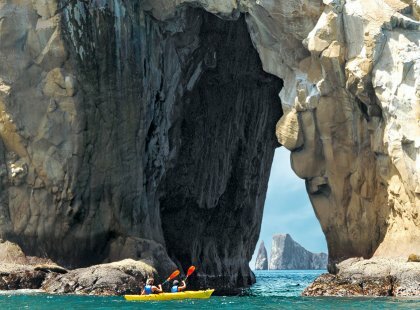 Following lunch, we take a motor yacht to Cerro Brujo, Punta Pitt or Leon Dormido, locally known as Kicker Rock, the jagged remains of an old tuff cone whose flanks are home to thousands of sea birds. The location will depend on park permits. We enjoy excellent snorkeling. 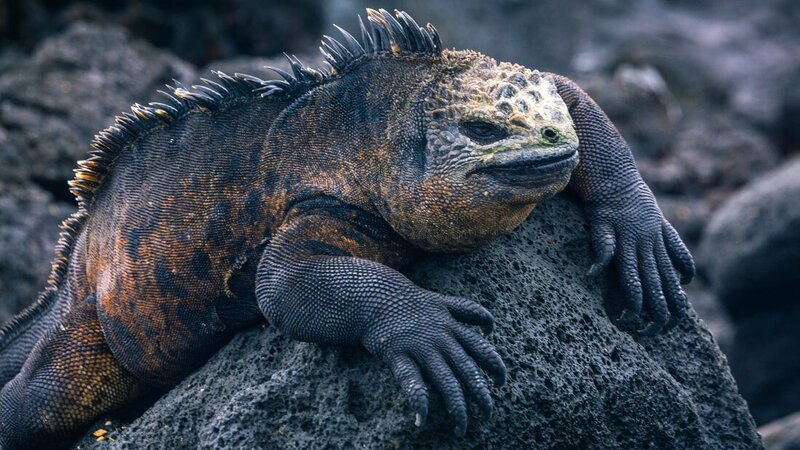 There is a good chance of seeing Galapagos sharks, eagles and golden rays, as well as dozens of species of tropical fish, clams, starfish, and marine invertebrates. With a little luck we may also swim with hammerhead and white-tipped sharks. We return to our hotel for dinner and our last evening on San Cristobal. All meals included. 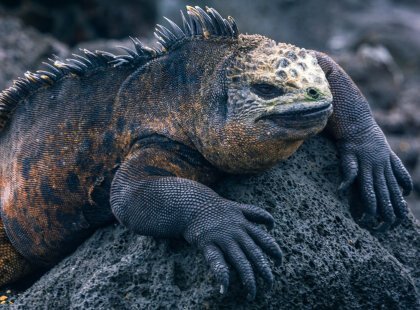 Day 7: Near Isabela Island, walk among marine iguanas and Galapagos penguins. After an early breakfast we take a flight from San Cristobal to Isabela Island, the largest island in the archipelago. Isabela was formed by six volcanoes - Alcedo, Cerro Azul, Darwin, Ecuador, Sierra Negra and Wolf. Five of these volcanoes remain active, making this island one of the most volcanically active places on earth. This is a remarkably beautiful island and one of the youngest in the archipelago. Isabela is also known for its beautiful and expansive white sand beaches. After lunch we head to Las Tintoreras, a set of small islets within Isabela bay, to walk through the otherworldly landscape of lava rocks. 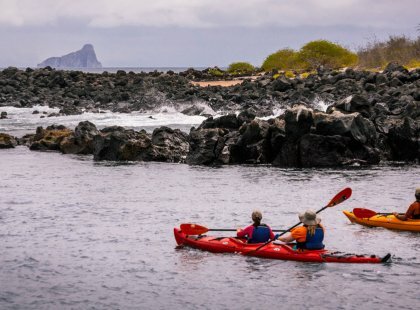 The islets are filled with wildlife - marine iguanas, blue footed boobies, whitetip reef sharks, marine turtles, penguins, and much more. The rest of the afternoon is free to enjoy the lovely white sand beaches in the port town of Puerto Villamil. All meals included.Hiking: 1 hour; Snorkeling: 1 hour. Day 8: Hike the rim of Sierra Negra volcano for views of an alien landscape. 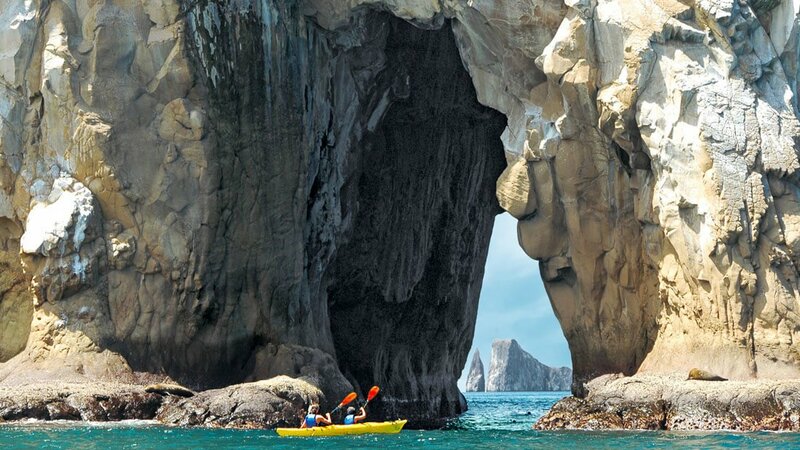 Today we explore the fascinating Galapagos highlands! We get an early start this morning to begin our hike over rugged terrain to the rim of the Sierra Negra Volcano (3,688'), the second largest intact caldera in the world after Ngorongoro Crater in Tanzania. The trail can be quite muddy or dusty depending on the season, but the walk is well worth it as the vantage point from the rim offers fantastic views of the six by five mile wide lava-filled caldera as well as the other volcanoes beyond and the surrounding coastline. After catching our breath, we can choose to continue along the trail to Chico Volcano (2,821'). With its puffing fumaroles and striking lava formations, it offers an out-of-this-world environment and good examples of the dramatic geological events that have forged the Galapagos Islands over millennia. In the afternoon we return to our lovely hotel with free time to wander the beach, swim or watch the iguanas and sea lions before dinner at our hotel. All meals included.Hiking: 6-9 miles. Up to 5 hours. Cumulative elevation gain ~ 1,260'. 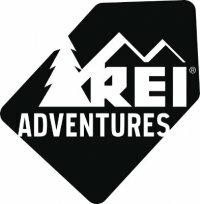 Terrain: uneven trails that may include slippery or rocky sections. Day 9: Bike Isabela's sandy roads to the historic Wall of Tears. After breakfast we gear up for a bike tour of Isabela Island and El Muro de las Lágrimas - Wall of Tears. 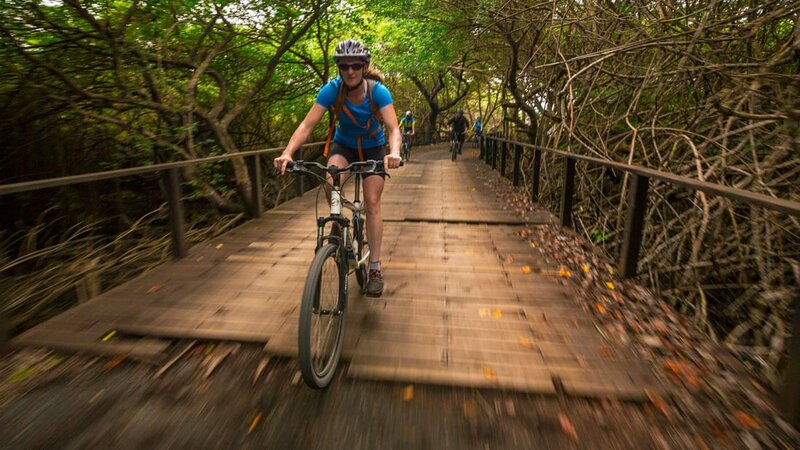 With miles of unpaved, sandy streets, mountain bikes are the perfect way to explore the island. 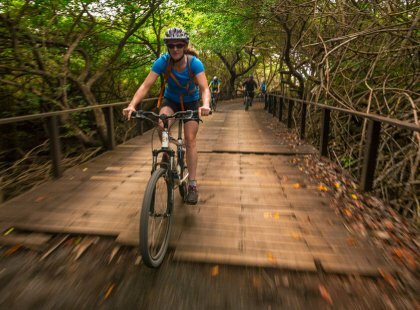 We ride along the coast with spectacular views as we pedal through mangroves and salty lagoons that are home to the mangrove finch, endemic to Isabela. We can also spot American oyster catchers, herons, flamingos, and many other shore birds. We reach the Wall of Tears, a historic site that dates back between 1946 and 1959 when Isabela was a penal colony. The wall was built by prisoners using huge blocks of lava for no other reason than to keep the prisoners busy from the madness of isolation. On our way back we ride by and explore Isabela's gorgeous white sand beaches. In the afternoon we can take the opportunity to walk through mangrove forest to Concha y Perla bay, whose clear waters are perfect for snorkeling. All meals included.Mountain biking: 8-10 miles, unpaved, sand and gravel roads with some rolling hills; Snorkeling: 1-2 hours. 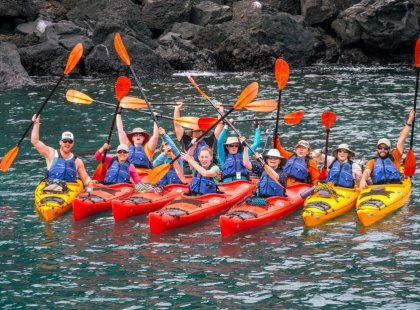 Day 10: On Santa Cruz Island, hike El Chato reserve and kayak lava channels. After an early breakfast, we transfer 2 hours by boat from Isabela to Santa Cruz Island. 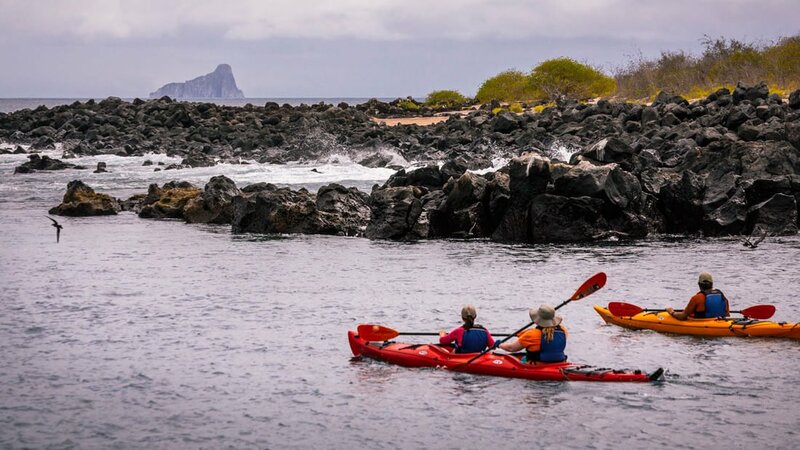 Once there we head to El Chato Reserve in the upper part of Santa Cruz Island – the natural habitat of the Santa Cruz tortoise, the largest in the Galapagos. 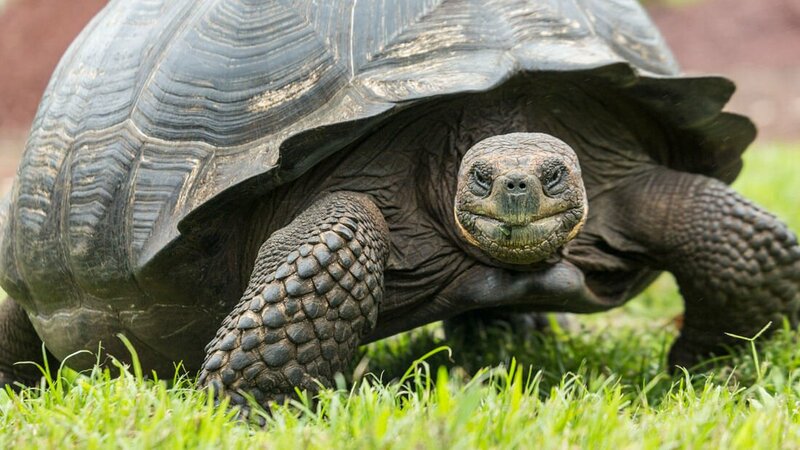 The most recognized symbol of the Galapagos, the tortoise weighs over 500 pounds and may have a shell measuring almost five feet! While we seek out these lumbering giants, we'll also come across pintail ducks, egrets, flycatchers, finches, and frigate birds bathing in freshwater lakes. We enjoy lunch at a traditional highland hacienda where we also explore lava caves featuring incredible volcanic tunnel formations. On a clear day we can see Media Luna from here, an old collapsed crater on top of Santa Cruz Island. 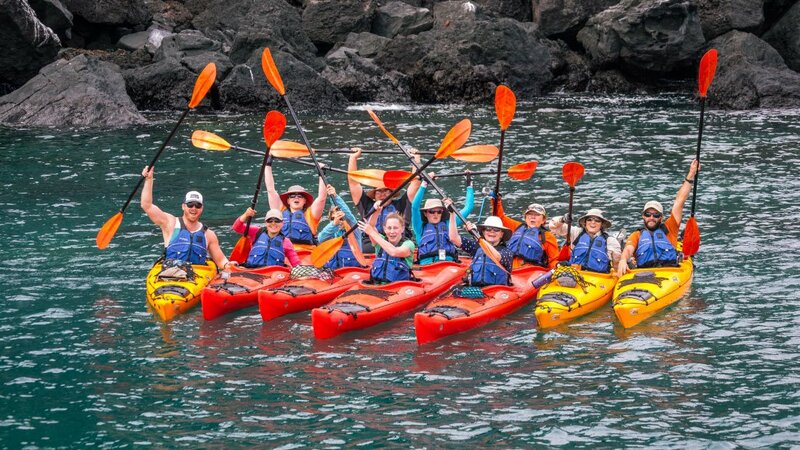 After lunch we slip into our kayaks and paddle around Divine Bay and Punta Estrada, traveling through multiple lava channels of calm, turquoise waters. Within the channels, white tipped sharks and rays patrol beneath the waves while colonies of blue footed-boobies, tropic birds, herons and marine iguanas perch along the jagged cliffs. Enjoy a farewell dinner this evening as you wrap up your adventure to one of the most magical places on earth. All meals included. Kayaking: 3 hours. Hiking 2hrs, 3 miles. 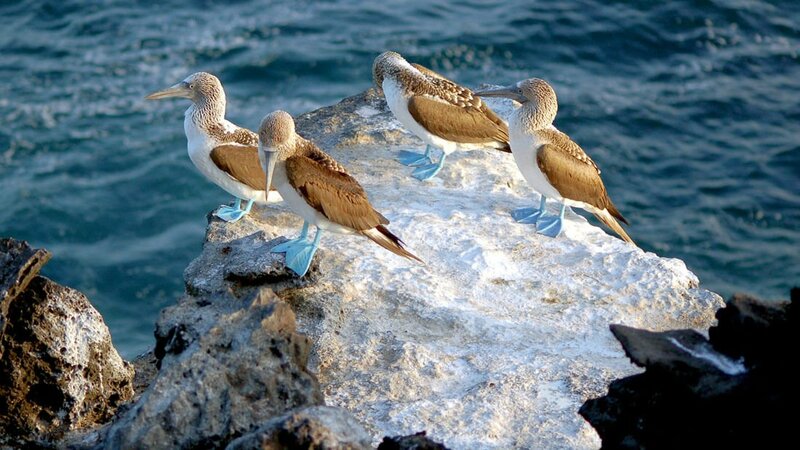 Day 11: Bid farewell to the Galapagos islands and fly back to Quito. If time allows (based on our return flight time to Quito), we visit the Charles Darwin Research Station to learn about conservation and management efforts in the archipelago. 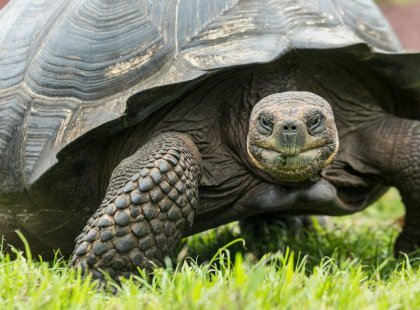 For 40 years, the research station was home to "Lonesome George", the famed Galapagos tortoise that became a symbol of the islands and their unique ecosystem. 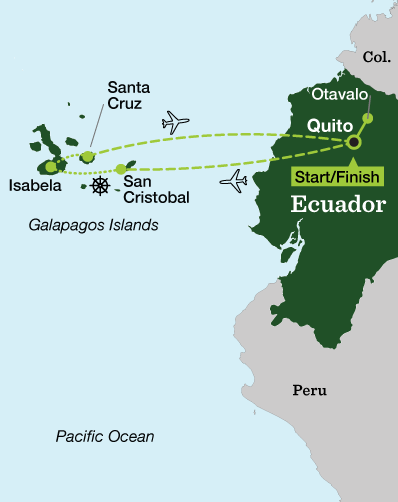 We then transfer to Baltra Island where we board our flight back to Quito. Meet your group in the hotel lobby this evening for dinner at a local restaurant. All meals included; light lunch on flight. Day 12: Depart Quito or explore more of this magical country. You can depart at any time today, or extend your stay to explore more of this wonderful country. 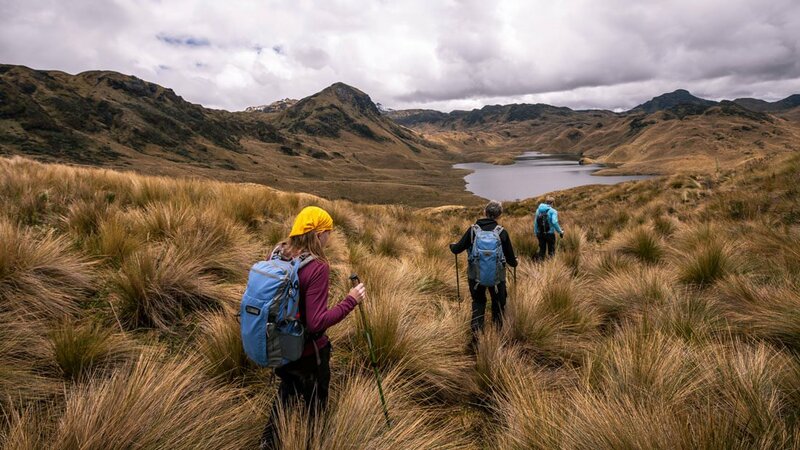 The transfer to the Quito airport is on your own, or book a private transfer through REI Adventures. Breakfast included.